Could Star Wars be Coming to Netflix Streaming? UPDATE: We've heard back from Disney & Netflix and they've said that there are no plans to currently stream any & all Star Wars movies through the platform. 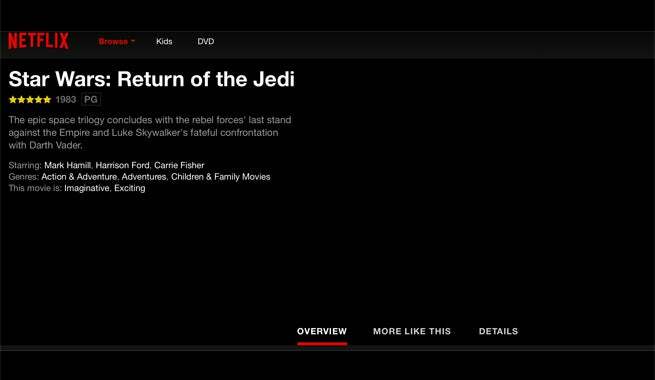 Some Netflix detective work by a blog that covers the streaming service called Extreamist points back to the rumor that Star Wars is coming to the streaming service, and sometime in the near future. Placeholder pages for all six live-action films, including both the Original and Prequel trilogy flavors are buried in the streaming service's website and app. The pages can't be found by simply putting in "Star Wars" or any of the full titles into the search. In fact, it oddly points away from the films entirely. While most movies or subjects, if you type in the name, give you some "related titles," when you type in "Empire Strikes Back" or other Star Wars titles, it just brings you to a "not found." However, with the numbered titles, placeholder pages, complete with cast info and a details page, are present. Here's Return of the Jedi's page, login required. The screenshot above shows it, in case they get wise and pull things down. So when could what's now a placeholder become an active page, and the ability to stream all six Star Wars movies on a subscription service become a reality? Well, probably not as soon as many fans would hope. After all, only six weeks ago Lucasfilm announced a new edition in special Steelbook cases for all six Star Wars films would be coming in October. Having them stream just before or just after that release wouldn't make much sense. However, having them come to Netflix in say, early to middle December, just before the release of Star Wars: The Force Awakens would make a lot of sense. Then the films would be used as supporting media for the film in theaters, and it would certainly be a Holiday coup for Netflix, as well. Streaming rights have been muddled for the six films, as they were originally distributed by 20th Century Fox. Recent undisclosed deals with Disney have allowed fans to buy them in unique digital editions, and stream through Disney Movies Anywhere, synced with Google Play, iTunes, Amazon, and more. Placeholder pieces are common on websites, and aren't ever exact sciences. After all, Variety has placeholder pages for most major celebrities deaths - and those sometimes go live on accident at the wrong time.